The ESWW will again adopt the central aim of bringing together diverse communities working on all elements of space weather with a strong focus on user involvement. This years meeting will discuss recent advances in both scientific and applications based domains and how these advances relate to user needs. 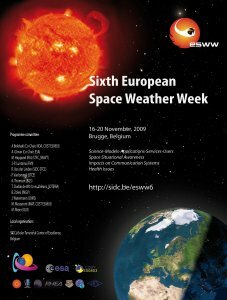 It will also provide an opportunity to discuss the Space Weather communitys contribution to possible future ESA action in the area of Space Situational Awareness. New data, tools and techniques will also be discussed and demonstrated during the workshop with a view to aiding the transition between new scientific results and user-oriented space weather services.